Responding to community needs, the FCJ Refugee Centre developed workshops for communities and front-line workers that serve vulnerable new comer sectors, non-status and precarious migrant populations. Increase access to legal education on important legislative, policy, and legal issues. Reach service providers where there is limited access to legal education and educational resources. 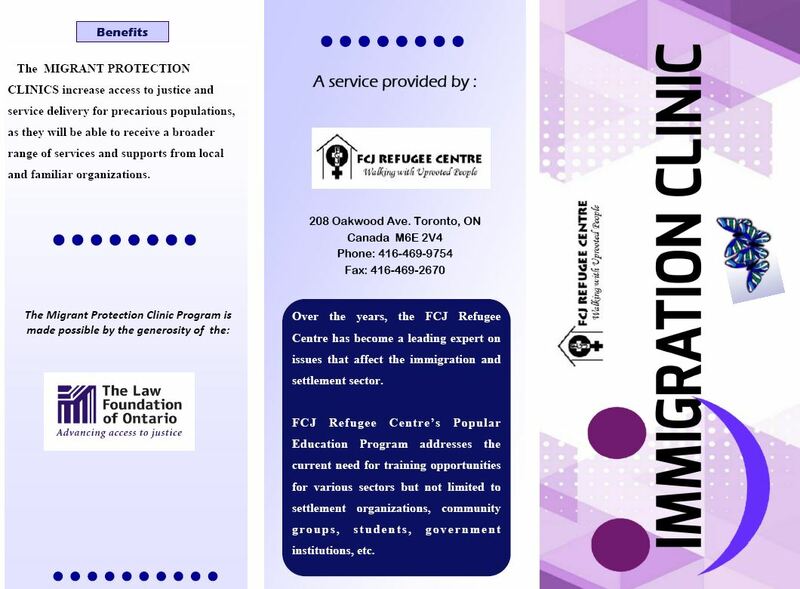 The MPC is a new program that allows FCJ Refugee Centre to implement migration and support clinics at various locations across the GTA and Ontario to offset the barriers, better equip a wide range of service providers and increase access to justice to a wide base of precarious migrant populations. Thanks to the Law Foundation of Ontario, FCJ Refugee Centre’s staff is able to work directly with staff at partner organizations to schedule appointments, complete intakes and work on various applications associated with different migration processes. A high level of changes in the immigration have been happening, starting on 2012 with the implementation of the New Refugee System. Since then, immigration has been announcing and implementing a lot of changes. Thanks to the generosity of UNIFOR TheUnion, FCJ Refugee Centre is able to continue supporting those working with vulnerable newcomer communities; raising awareness of new policies and laws and how to successfully navigate these changes. The Housing Support Coalition is a community-led, collaborative support network to offer an extensive holistic response to address the complex housing needs of precarious migrant populations. The Coalition involves key stakeholders from multiple sectors related to housing issues, including: shelters, municipal administrative bodies, settlement agencies, the legal community as well as precarious migrant populations. Members meet periodically to engage community members and government officials in dialogues and solutions around issues related to provide affordable and sustainable housing to marginalized migrant groups. If you want to know more about the coalition and join the meeting click here. In conformity with its mandate FCJ Refugee Centre received funding from Ministry of Citizenship and Immigration, Ontario to enhance the delivery of its settlement program to improve services for vulnerable newcomer populations experiencing multiple barriers. The project is two folded: 1) continue providing a variety of services to vulnerable newcomers including orientation, settlement support, counselling, and referrals to appropriate services; 2) provide workshops to service providers and other stakeholders to share effective service delivery practices identified by FCJ Refugee Centre to meet the needs of vulnerable newcomer populations. The workshop is multifaceted and can be altered to the unique needs of each organization. Vulnerable newcomer population consist of refugee claimants, trafficked persons, non-status individuals, including newcomer youth and others experiencing multiple barriers due to their intersecting identities. If you are serving such populations request a workshop to expand your knowledge and straighten the abilities of your agency to provide services tailored to the needs of those populations. The Centre offers a variety of workshops to settlement agencies, frontline workers in shelters, and to refugees. To schedule a training please fill out the Request Form and send it back to us. FCJ Refugee Centre’s Settlement and Integration Sector Professional Development Training Program provides training for staff from settlement and integration service providers. The objective is to provide professional development and training opportunities that achieve increased skills, knowledge, and enhanced organizational capacity to deliver front-line client services. Training sessions are provided directly in your workplace to ensure that all levels (junior, medium, and senior) of staff receive the training as well as reach individuals who are both new or have worked within the settlement sector for several years. This unique training program also provides opportunities for networking, sharing of information and expertise, and innovative approaches that address current and emerging issues within the settlement service sector. The FCJ Refugee Centre provides workshops for service providers, legal and mental health professionals and other interested groups on various aspects of Human Trafficking. These workshops are designed with the knowledge and objectives of the participants in mind and can be tailored to include as much basic or advanced information as needed. The goal is to provide professional development for a range of people who may come into contact with victims/survivors of human trafficking in various capacities. Thanks to the generous support of the Canadian Women’s Foundation, the FCJ Refugee Centre was able to develop two new modules for the Anti-trafficking manual specifically related to legal support for the Temporary Resident Permit application and Mental Health Support for survivors. Workshops have been developed to increase knowledge among professional and front-line service providers in these very specific areas. We also continue to provide workshops on human trafficking in general, identification of trafficked persons and social service and integration support. Since its inception in 2011, the FCJ Refugee Centre has coordinated the Toronto Counter Human Trafficking Network, organizing monthly meetings and working hard to raise awareness and grow the membership. Through an anti-oppression anti-racism framework, the Network has worked collectively to develop a vision and mission that reflects the needs of counter human trafficking work in the GTA. We have worked on campaigns, given deputations at City Hall, and worked with City officials. Collectively we have developed our understanding of each other’s work to offer support to each organization when needed, and have the knowledge and confidence in each other to refer people when appropriate. The Network continues to grow and evolve, identifying new priorities and projects and working to develop an integrated and robust effort to counter human trafficking at multiple levels.